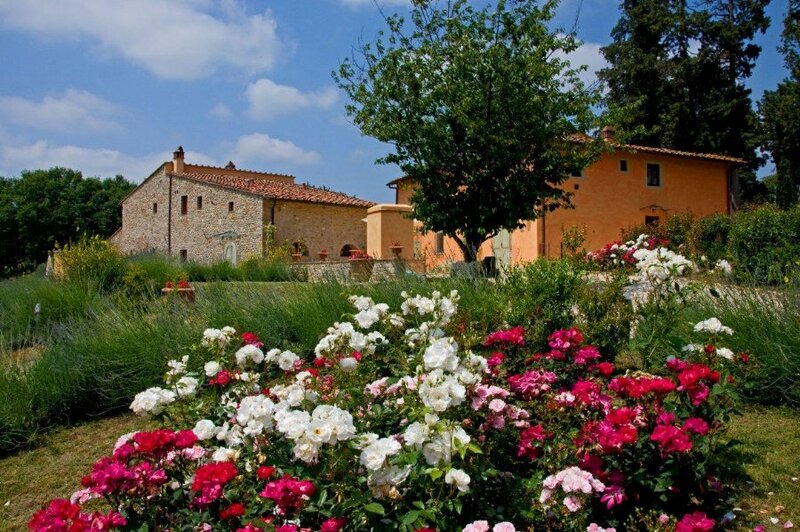 Borgo Casciano offers a terrific setting for a large gathering or for smaller groups. The entire villa is complete with five apartments that accommodate 22 guests and can be rented as one exclusive dwelling for a large group. The apartments can also be rented separately. The location of Borgo Casciano is ideal for day excursions throughout Tuscany. From its perfect vantage point directly in the heart of Chianti, you can reach Florence, Siena or Lucca in less than an hour, and all of the beautiful hill towns of the area are within easy reach. The closest village is Mercatale Val di Pesa, with shops and restaurants, which you can reach with a five minute drive or a fifteen minute walk through the fields. There is a nice selection of restaurants within ten minutes' drive, and you will find a list of recommendations and useful hints in the villa. Facilities for horseback riding are available nearby. The buildings of Borgo Casciano were once an old mill, with an adjacent barn. In 2011 they were completely restored and transformed into five stylish and well appointed country units. The English speaking owners live in a separate historical villa about 200 meters from the borgo. Their grounds are entirely separate. They are welcoming and happy to help guests during their stay. The estate is surrounded by vineyards, olive groves and fields that are often full of sunflowers...the quintessential hills of Chianti! The large pool is located in a panoramic setting in the middle of the olive trees. A short drive along 300 meters of an unpaved country lane lined with cypresses leads to the property. Each apartment has a private outdoor area for al fresco dining, and there is a common outdoor area with parasols and lounges where guests can gather together. Each accommodation has been furnished with taste and care, with Tuscan colored walls, terracotta floors, original art, antiques and beautiful fabrics. All of the bedrooms are air conditioned, and amenities include WIFI internet, satellite TV, radio, microwave/convection oven, refrigerator, American and Italian coffee makers, toaster, barbecue and hair dryers. There is a washer/dryer combo unit in all of the units except for Capanna Borgo Casciano 3 which has a washing machine and drying rack. All units have ironing facilities. Florence is about 20 minutes away, Greve in Chianti 25 minutes, San Gimignano 30 minutes, Siena 50 minutes. Montalcino and Pienza can be reached in about 90 minutes, and the Tuscany coast is about an hour's drive. The nearest airport is Florence, about 30 kilometers away. Borgo Casciano offers five apartments, which can be rented separately or in any combination up to 22 guests. It's an ideal location for a family reunion or gathering of friends. 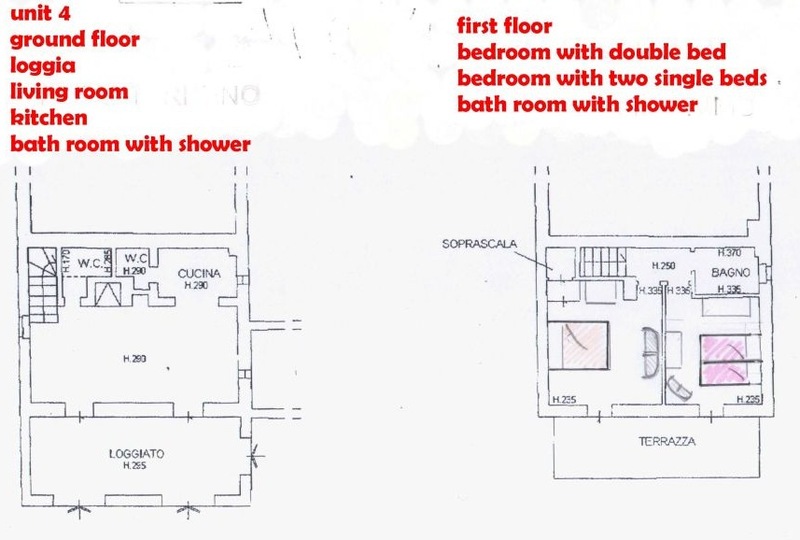 To see the full property, please look at Borgo Casciano 22. Units 1/2/3 are located in the larger building, which was previously the olive oil mill. Units 4/5 are located in the smaller building, which used to be the barn. Entry way loggia with large arched windows, open dining/living room with fireplace and dining area, kitchen, small bathroom with shower; Spacious private furnished panoramic wrap-around terrace. One queen bedded room with access to balcony, one twin bedded room (beds can be joined) with access to balcony, one bathroom with shower. Washer/dryer combo unit and ironing facilities. Late arrival: Upon request and approval of the owner a late arrival is possible between 7:00pm and 9:00pm for an extra fee of 50 Euros.